U.S. sales of chocolate went from $14.2 billion in 2007 to $18.9 billion in 2017, a period during which overall sales for candy declined, largely because of growing health concerns over sugar. How did chocolate manage to buck the bear market in candy? One reason is the widespread perception that chocolate, unlike other sweet treats, is not just delicious but good for you. Leaving aside such historical hype, many modern studies have shown, in fact, an association between the consumption of pure cocoa, which is rich in compounds called flavanols, and moderate reductions in risk for a range of cardiovascular illnesses and even for diabetes. Research done in 2009 on the Kuna people, who live on islands off the coast of Panama, lends some credence to these results. Dr. Norman Hollenberg of Harvard Medical School found that the Kuna, who drink up to 10 cups of gravy-thick homegrown hot cocoa a day, live longer and have lower rates of hypertension, heart disease and stroke than most Western populations, though other factors may also contribute to their outstanding health. Science has also delved into the impact of cocoa products on various brain functions. A review published last May in the journal Frontiers in Nutrition found evidence that cocoa flavanols may help to focus concentration and improve memory and may even slow the mental decline that often comes with aging. ... ... the Cosmos trial—is administering cocoa flavanol capsules together with placebos to over 21,000 individuals. Harvard’s Dr. JoAnn Manson, a co-director of the study, says that while previous research shows that cocoa can lower blood pressure and increase the elasticity of blood vessels, “the jury is still out on whether this translates as lower risk of heart attack and strokes.” The researchers hope to provide some definitive answers when they publish their findings in 2020. Dr. Marion Nestle (no relation to the chocolate manufacturer), a professor emerita in the nutrition and food studies department at New York University, points out that most chocolate research has been funded, at least in part, by chocolate companies. “In general, they get overwhelmingly positive results. Whereas studies that are independently funded have mixed results,” Dr. Nestle said. “Bias can creep in with the research question that they ask, or how they interpret the results.” In fact, all of the studies I have cited in this article have received at least some of their funding from chocolate manufacturers or analyze research that did. As I touch on in "Let's Set Half a Percent as the Standard for Statistical Significance," scientists distort evidence quite a bit just for the academic rewards of getting published in journals. The desire to secure funding can also tilt research. Still, I think of chocolate as not only delicious but healthy—except for the sugar in most chocolate. So I try to eat chocolate that has such a high percentage of cocoa that I figure there isn't much room left for a lot of sugar. Let me review several types of chocolate bars with very high percentages of cocoa. I assure you, I don't receive any money from companies that sell chocolate, unless you count my income from the University of Colorado Boulder, the University of Michigan and the University of Southern California, which no doubt sell chocolate in their university bookstores. ChocoPerfection bars are sweetened to chicory root and erythritol. Though my approach differs from keto in important ways—see especially "Forget Calorie Counting; It's the Insulin Index, Stupid" and "The Keto Food Pyramid"—I take the keto folks as my experts on which nonsugar sweeteners are OK: chicory root and erythritol are some of the few that pass muster by a reasonable consensus among keto folks. 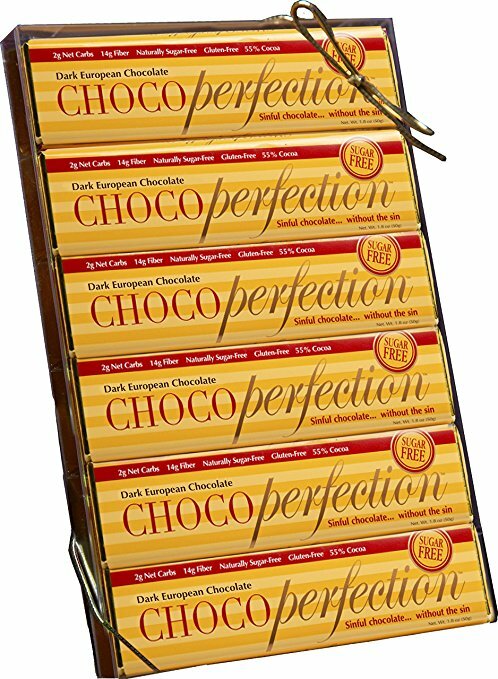 Most of the time, ChocoPerfection bars seem too sweet most of the time, but sometimes a jolt of sweetness is nice. Beyond those two types, I have tried many others that I found by one of two procedures: (1) searching on Amazon for every type of chocolate advertising a percentage of cocoa 88% or above and (2) looking for everything 88% or above in my local Whole Foods store, where I thought I could catch some more exotic brands. I am sure I missed some, and new brands keep getting added. If there is anything I don't mention that is 88% or above—or even 85% or above—that you recommend, let me know and I will try it if I can find it reasonably easily. I am intrigued to try Arete's Guatemala Lachua Micro-lot 100% Dark Chocolate when it is no longer sold out. It is actually a hard decision which I prefer between the Arete Vietnamese 100% Chocolate and the Ritual 100% Chocolate. Each has its own distinctive sophisticated taste. The Ritual 100% Chocolate has a floral aftertaste. Lastly in this category, Primal Chocolate Midnight Coconut advertises itself as 100% cocoa. It has no sugar and a little coconut. I don't recommend it, but it was better than I expected from a 100% chocolate bar before I tried the Arete and Ritual chocolate bars above. Of course, the flipside of "accessible" is that some may consider these bars a little bland. But they go down easily and have a pleasing aftertaste. These use stevia as a sweetener instead of sugar. Opinions on stevia as a nonsugar sweetener seem to vary more than opinions on chicory root and erythritol. TCHO Dark Chocolate Critters advertise themselves as good for baking and cooking. In that context I think they would be great. 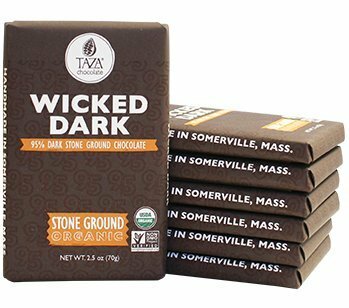 To me, Wicked Dark bars tasted awfully, by far the worst of any of the chocolate bars reviewed here. They are suitable only for gustatory masochism, unless your tastes are quite different from mine. I expect to eat many more of them in the future. I also very much like LAmourette's Extra Smooth Chocolat Noir 91% cacao bar shown below. Online it appears to list for $30 a bar! But I bought one for $7.95 at the wonderful Boulder Book Store on Pearl Street. To my taste, the LAmourette's Extra Smooth Chocolat Noir 91% cacao bar is also a step above the Endangered Species panther bar. By contrast, the a 90% chocolate bar that is easy to find in stores but that I find boring is Lindt 90% chocolate. A bit bland was a virtue in the 99% Lindt bar, but at 90%, a chocolate bar should be delicious. To me, the Lindt 90% chocolate bar isn't. In the Greek myths, Prometheus was punished for giving fire to humans. In a Mesoamerican myth, Quetzalcoatl was cast out from among the other gods for sharing chocolate with humans. So by ancient American tradition, chocolate is the food of the gods. Enjoy! and this bag. He also tweets a recommendation for these cocoa extract pills. More recommendations from others are coming in that I will report as I get them clear. Don’t miss my other posts on diet and health. How Important is A1 Milk Protein as a Public Health Issue? See the last section of "Five Books That Have Changed My Life" and the podcast "Miles Kimball Explains to Tracy Alloway and Joe Weisenthal Why Losing Weight Is Like Defeating Inflation." If you want to know how I got interested in diet and health and fighting obesity and a little more about my own experience with weight gain and weight loss, see “Diana Kimball: Listening Creates Possibilities” and my post "A Barycentric Autobiography.